It seems like there's more of everything in the world of cloud communications these days: more enterprises studying the migration and more actually embarking on it; more providers getting into the market or bidding to move upmarket; more variations on how the service is delivered; and if not more reasons for going to cloud, at least there's a continuing evolution in the reasons which seem most compelling. 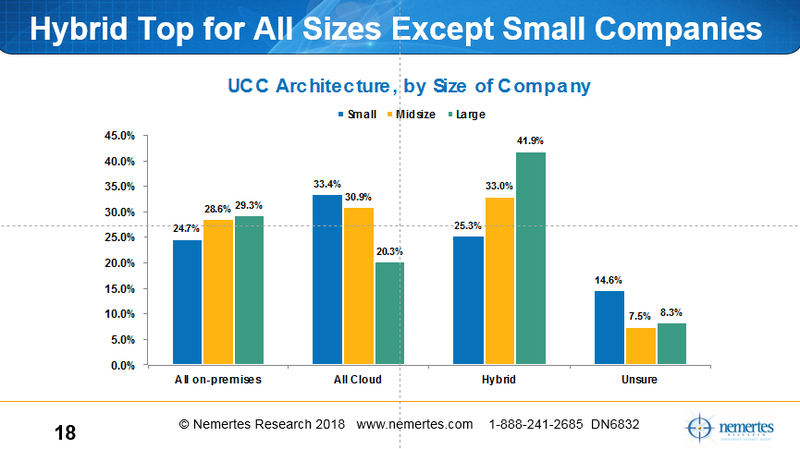 We saw this last week during an Enterprise Connect/No Jitter webinar in which Robin Gareiss, founder and president of Nemertes Research, presented some hot-off-the-presses data on enterprise adoption and attitudes with regard to cloud communications. The top-line message was that enterprises see business agility, not cost or any other factor, as the real benefit of migrating to the cloud. This is something that our own contacts in the enterprise end user community have been telling us: It's much more important than ever before to be able to roll out a feature quickly once some constituency within the enterprise has declared that feature to be a key factor in a significant business initiative. In Nemertes' most recent benchmark survey, just over 44% of respondents cited "improved agility for IT" as the biggest driver for the move toward cloud communications -- up from just 29% a year ago and now the number-one driver. In contrast, enterprises seem to be understanding that cost may not be as compelling as they once thought; 33% of respondents cited cost as the primary driver, steady year over year but down from 49% two years ago. Not that financial issues are fading away; the issue of capex vs. opex ranked as the second-biggest driver in the most recent data, at 37%. When it comes to choosing a cloud communications provider, "technology is really the cornerstone," Robin told our webinar audience. Indeed, 47.5% of respondents who have a strategic cloud communications provider said that what makes the provider strategic is that it "has the best technology available." That's a strong recommendation, but we all know that the best technology doesn't always win in the market or even within the enterprise, and Robin emphasized this point in the webinar as well: In order to remain strategic as the technology matures, she said, providers will have to score higher on a couple of other points -- "understands our business" and "proactively provides suggestions to help our business." Those two items scored 36% and 27%, respectively. Finally, when it comes to choosing an architecture, Robin presented data showing the trend toward hybrid cloud is, if anything, strengthening. Nemertes found respondents moving away from both CPE and pure-play UCaaS, with a plurality (38%) saying they're planning a migration to hybrid, whether as an end-state or as a transitional stage toward a pure cloud architecture. And large enterprises are the most inclined to go hybrid. Nemertes found that 42% of large companies are planning a hybrid architecture, versus 29% all-CPE and 20% all-cloud. Only small enterprises were more inclined to go pure cloud than anything else, while midsize enterprises split 33% hybrid versus 31% all-cloud. Another interesting point Robin raised was the importance of understanding how your hybrid architecture affects your management environment. Specifically, she suggested trying to match the capabilities and features of your cloud management tools with CPE tools, so that you have some ability to manage the whole thing somewhat cohesively. I'm just scratching the surface of the material Robin presented. I encourage you to listen to the replay so you can get the full flavor of this newly released data. And of course we'll be exploring all of these UCaaS/cloud communications issues exhaustively at Enterprise Connect Orlando 2018, which is almost upon us. If you haven't registered yet, there's still time. If there are clouds on your communications horizon, we've got the expert speakers to help you see clearly. Learn more about Cloud Communications at Enterprise Connect 2018, March 12 to 15, in Orlando, Fla. Register now using the code NOJITTER to save an additional $200 off the Regular Rate or get a free Expo Plus pass.